Boxcutters, Forks, Jigger, Ladle, Bowl, Coupe Glass. 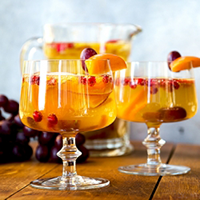 Combine in a Bowl, Fruit, Sugar and Brandy and let sit at room temperature until sugar dissolves, about 15 minutes. Add Cider, cover and refrigerate for at least 8 hours or overnight.